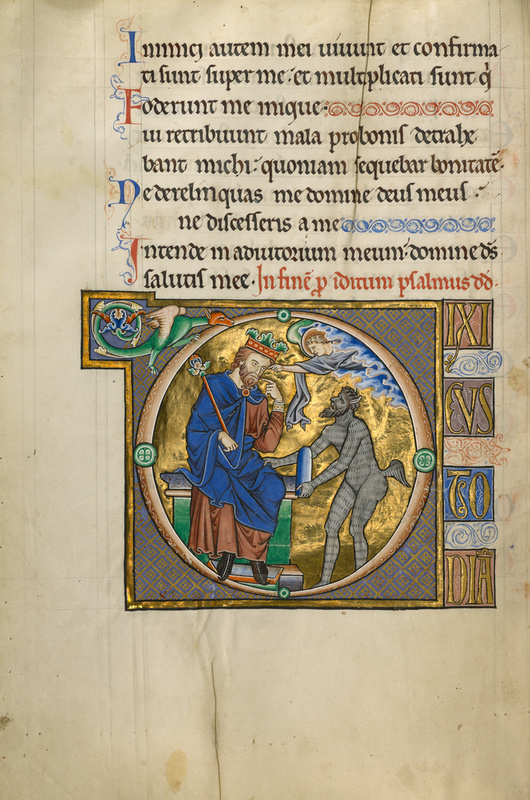 A demon tugs on David's cloak, tempting him to sin with his tongue, as warned against in the first line of the psalm: "I said I will heed my ways that I not sin with my tongue." The illuminator masterfully rendered David's jaw, clenched against the demon's temptation. An angel rushes in from the clouds and points to David's eye, which may be a reference to his lustful spying on Bathsheba. Medieval commentators associated Psalm 38 with David's sin of sending Bathsheba's husband to be killed in battle, leaving him free to pursue her.